KAIDIE’S FINAL 40 DAYS: As Kaidie’s Forerunner CHRIS MARKER moves on, she too begins to pack her bag. Beckoning cats. 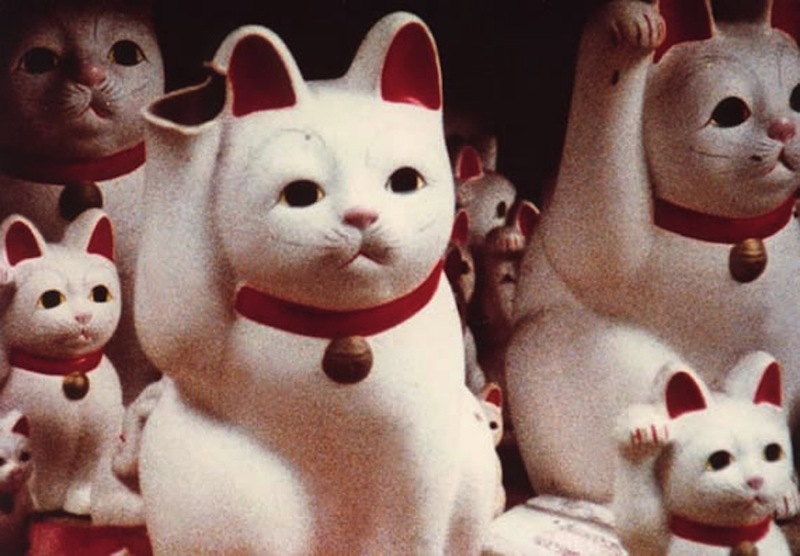 Film still from Chris Marker's Sans Soleil (1982). Before Kaidie as Kaidie, her encounter with Chris Marker’s Sans Soleil in 1994 at the Everyman Cinema changed her world, for ever. Marker’s breathtaking cine-essay made her the restless being that she has been, and made her the trans-runner that she is today. As Kaidie prepares for her own death, Chris Marker’s death at the age of 91 has filled her with a mixture of ecstasy and sadness: will she run into him in her next lap? Chris Marker (1921-2012), rest in peace. This entry was posted on Tuesday, July 31st, 2012 at 11:00	and is filed under THE LAST (FINAL) 60 DAYS. You can follow any responses to this entry through the RSS 2.0 feed. You can leave a response, or trackback from your own site.